This lively and wide-ranging study of the men and ideas of late antique education explores the intellectual and doctrinal milieux in the two great cities of Athens and Alexandria from the second to the sixth centuries to shed new light on the interaction between the pagan cultural legacy and Christianity. 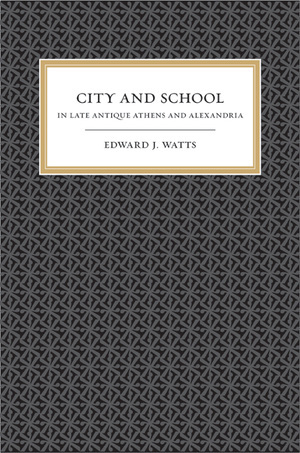 While previous scholarship has seen Christian reactions to pagan educational culture as the product of an empire-wide process of development, Edward J. Watts crafts two narratives that reveal how differently education was shaped by the local power structures and urban contexts of each city. Touching on the careers of Herodes Atticus, Proclus, Damascius, Ammonius Saccas, Origen, Hypatia, and Olympiodorus; and events including the Herulian sack of Athens, the closing of the Athenian Neoplatonic school under Justinian, the rise of Arian Christianity, and the sack of the Serapeum, he shows that by the sixth century, Athens and Alexandria had two distinct, locally determined, approaches to pagan teaching that had their roots in the unique historical relationships between city and school. Edward J. Watts is an Associate Professor in the Department of History at Indiana University.